Getting enough rest by having the right kind of sleep at the right amount can do wonders for your health. A good mattress can make all the difference between good night sleep and a terrible one. Futon mattresses are a staple in Japanese bedrooms and are a tried-and-tested companion for a well-rested night. The EMOOR Japanese Traditional Futon Mattress Classe fits the bill when it comes to comfortable futons. This futon mattress is made by EMOOR, a company that manufactures traditional Japanese cushion products. The mattress design allows it to be stored in a closet after use so that limited living spaces are maximized, which is common in most Japanese homes. Futons are beddings that are thought to originate from Japan. These types of beddings that are somewhat unique to the Japanese culture have found its way into other Asian nations and all the way to western countries. The typical bed mattress with the bed frame and headboard are used by many as well, but the traditional futon has become a way of life for many people, and it can become yours too, and here are the reasons why. Nothing says quality like a label that says made in Japan. The Japanese pride themselves in striving close to perfection in everything that they do, whatever it may be, and products like the EMOOR Japanese Traditional Futon Mattress Classe is no exception. With that label comes the guarantee of a cozy and well-rested night. 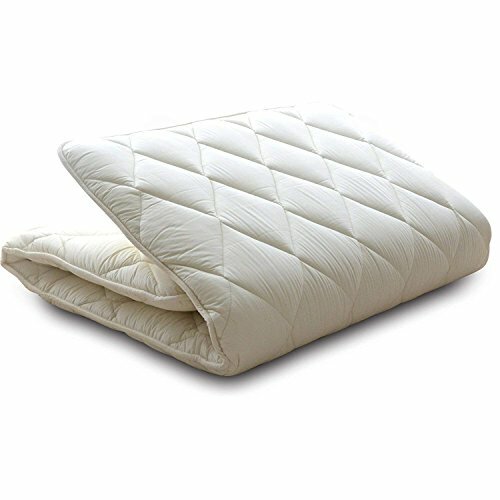 This futon mattress was made using a firm polyester pad that is sandwiched between two layers of soft polyester quilt filling. This gives the mattress the right amount of firmness which doesn’t feel hard. It provides the right amount of support which is good for your back. The wadding used is TEIJIN MIGHTYTOP (R) II ECO, which has a treatment that combats bacteria and mites, and fights off unwanted odors. This is coupled with an outer cotton cover that gives a cool and comfortable feeling to the user. The EMOOR Japanese Traditional Futon Mattress Classe is Japanese made futon that brings you the highest standards in beddings for the comfiest and cushiest sleep you can have. It is made with the high-quality polyester pad and filling. Together they provide firm but not hard support, which will do wonders for your back. Unfortunately, this mattress is not washable, but you do have the option to place a cover that can be washed along with the other beddings. It is also equipped with antibacterial, anti-mite, and deodorizing treatment that keeps your futon mattress hygienic for two to three years. It works best when used in the traditional Japanese sleeping arrangement which is laying it out flat on the floor or the tatami mat. You can also spread it out on top of a regular bed mattress in western style beds as an added cushion. Both are equally guaranteed to give you a relaxed and deep sleep. The mattress comes in a standard queen size, so your existing beddings and sheets can easily fit it. You can buy new sheets and not worry about them not being the right size. No more stretched out beddings, and no more awkward overhanging edges when you put in on top of the bed mattress. When used in the traditional way, this futon mattress is a breeze to fold and easy to carry for quick storage in the closet. The EMOOR Japanese Traditional Futon Mattress Classe is almost the same as the Luxton Home Traditional Japanese Futon Mattress. Both were made for traditional Japanese homes, where sleeping mattresses are stored in closets during the day, and taken out and spread out on the room matting at night. Both boast good back support. The EMOOR Japanese Traditional Futon Mattress Classe used a firm polyester pad, while the Luxton Home Traditional Japanese Futon Mattress was made to be thin to make use of the flat surface it is placed upon to keep the back aligned. It both has antimicrobial properties, but the Luxton Home Traditional Japanese Futon Mattress goes the extra mile by making the materials hypoallergenic, making it perfect for babies and those with sensitive skin. The Luxton Home Traditional Japanese Futon Mattress can also be washed, unlike the EMOOR Japanese Traditional Futon Mattress Classe. The Luxton Home Traditional Japanese Futon Mattress is thin enough to make it portable with a few folds. It is also lightweight that you can bring it with you on outings. In a head-to-head challenge, one of these two takes the upper hand. The EMOOR Japanese Traditional Futon Mattress Classe has the lead over the Luxton Home Traditional Japanese Futon Mattress. While both are traditional Japanese futon mattresses, they have distinct properties that give them an advantage over the other. The EMOOR Japanese Traditional Futon Mattress Classe is thicker, which offers better cushioning. The firm but not hard polyester pad provides the necessary support especially for those with back problems. While The Luxton Home Traditional Japanese Futon Mattress was made to be thin to take advantage of the firmness of the floor, it might feel too hard for some people. The former has the sweet spot in cushioning by finding a balance between soft and firm. Although it cannot be washed, the EMOOR Japanese Traditional Futon Mattress Classe has a deodorizing treatment that keeps the mattress odor-free. You can also put on a cover that was specially made for it. Overall, the EMOOR Japanese Traditional Futon Mattress Classe embodies the Japanese way of life, allows for easy storage and set up, and provides maximum support and cushioning. It maintains a bacteria- and mite-free sleeping environment and remains odor-free, which means less hassle with maintaining it for at least two to three years. The EMOOR Japanese Traditional Futon Mattress Classe is the better choice for a futon mattress.